Your best text types resource, from the lecturer theatre to the classroom Write Ways is a practical, user-friendly text for both teacher education students and practicing teachers. 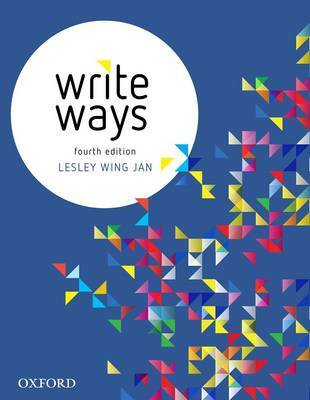 It explains how to teach students to write in all the major text types-not only in English, but across the curriculum-and provides clear, useful examples of classroom practice, planning and assessment. New to this editionReferences to the Australian CurriculumIncreased focus on grammar multiliteracies, literacy practices and teaching focuses at whole text, paragraph, clause, sentence, word group and word levelMore emphasis on multiliteracies, critical literacy and ICT, and how these look in classroom practiceICT margin notes suggesting how to use technology to teach text typesAll new sample units at the end of chapters 6 to 16. Theseinclude multiple sequences that enable teachers to adapt teaching focuses to specific teaching purposes and student needs across many year levels are developed around the threads within specific sub-strands of the Australian Curriculum: English rather than narrow year-level content descriptions, thus enabling teachers to tailor their instruction to individual students and plot student learningencourage engagement with a variety of text formats, from paper-based to multimodal demonstrate the interrelatedness of speaking and listening, reading and viewing, and writing.More on programming and planning, including suggestions for how to use the Australian Curriculum: English for planning in both primary and secondary contexts, how to link assessment to teaching, and how to support students as they write.